Harper government admits in submission to the UN. Full story here. 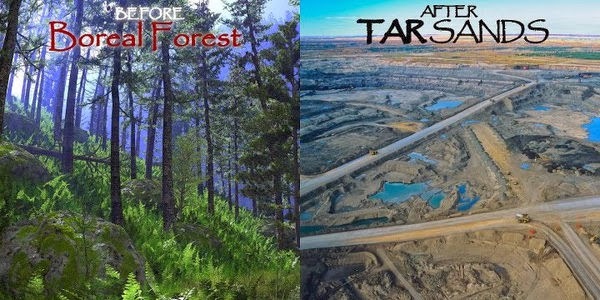 Every time I read that Canada is responsible for the horror called the Tar Sands (among other things), I cringe. This is The Harper Government (really, he wanted to change the name from the Government of Canada). He is a fascist comparable to others equally as monstrous in history. His racial target is the First Nations but his real holocaust is being wrought on the environment - and all of us by extension. When song writer and musician Neil Young blasted the Harper government for allowing oil sands development, he was ridiculed and praised for his outspokenness. Nevertheless, he has stirred a flame of reverence for what is happening and taking place in the Alberta Athabaska Oil Operation, reminding us that we will pay the ultimate consequence for this method of degradation for oil exploitation. A recent study suggests the environmental health risks of oilsands operations in the region have been underestimated. of the land area involved, had been leased for oil sands operations. 71,500 hectares of boreal forest have been disturbed by mining operations. an Act of genocide. Some may refer to the oil sands as a crude and ignorant operation. The government says we need those jobs and the economy that it brings to us. in the way of any ambitious projects, we are told. relies on for water and environment protection. this earth, but at the oil sands it is treated with contempt. and processing the black gold, and all with the approval of our government. Little caring and not registering, once this precious life sustaining liquid is polluted and undrinkable, we will be exterminating ourselves to extinction. For whatever we do to the web strands of life, we ultimately do to ourselves. Will we, as a society, ever learn?. Perhaps,..but unfortunately, only after it is too late. of make believe and are being misled by sensational news and unfounded allegations. When I see photographs and read that 17,600 hectares of tailing ponds presently exist, with a toxic blend of hydrocarbons, silt, salts and heavy minerals and reported as a lingering headache for the industry, I get troubled and concerned, as we all should. I do not believe these are make believe and unfounded news clips. ponds could be released into the environment. in the process of promoting economic benefits to the oil masters. That is suicidal, not progress!